Despite the ubiquity of some members of the Bombycill-idae, the taxonomic status of the waxwings, their relationship to the gray and silky flycatchers, and indeed the relationships among these flycatchers themselves, remains controversial. Most modern taxonomic treatments place the waxwings proper (Bombycillinae) within the order Passeriformes together with the silky flycatchers (Ptilogonatinae) and the palmchat (Dulidae). This classification is based primarily on coloration, nesting, skeletal features, musculature, and results of DNA-DNA hybridization studies. Here the consistency ends. Waxwings have also been allied with several other Passeriformes, including thrushes (Turdidae), Old World flycatchers (Muscicapidae), pipits (Motacillidae), and starlings (Sturnidae). More controversial is the placement of the gray hypocolius (Hypocolius ampelinus). This Middle Eastern bird is frequently allied with the other bombycillids, either as a subfamily or as a monotypic family closely related to the waxwings and silky flycatchers. 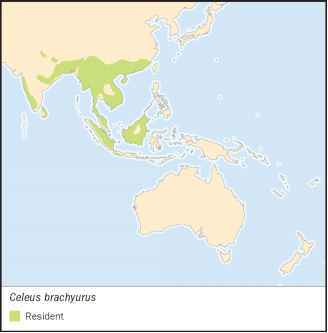 However, Hypocolius has also been allied with the bulbuls (Pycnonotidae) and thrushes. Further research is needed to resolve these relationships. This treatment recognizes three subfamilies. They are the waxwings: Bombycillinae, comprised of one genus and three species: the cedar waxwing (Bombycilla cedrorum), bohemian waxwing (B. garrulus), and Japanese waxwing (B. japonica). The silky flycatchers, subfamily Ptilogonatinae, with three genera and four species: the phainopepla (Phainopepla nitens), black and yellow silky flycatcher (Phainoptila melanoxantha), long-tailed silky flycatcher (Ptilogonys caudatus), and gray silky flycatcher (Ptilogonys cinereus). The latter is not to be confused with the only member of the third subfamily—the gray hypocolius (Hypocolius ampelinus) of the Hypocolinae.